Selina Greene is a busy lady as she owns Book Island the sim that's all about reading and writing and promoting aspiring authors. Wanting to change avatars I come on to Second Life after getting home from a hard day of real life work. A short time later I see a notice for Selina Green's Open Mic at Book Island at Book Island (42/48/25). I say what the hey, if i'm online anyway I can go check it out. I warp into the Book Island library and there's a large group of avatars there already at 1pm SLT. Selina mentioned earlier that she does hold Open Mic every Sunday at 1pm SLT. She says hello Grease glad to see you come over voice with her smoky british accent. By habit I respond to her over voice when she's done speaking. She asks me politely in IM to use chat instead of voice. Now I know so for the rest of the event I chat only except when I read my own writing then I was allowed to use voice. 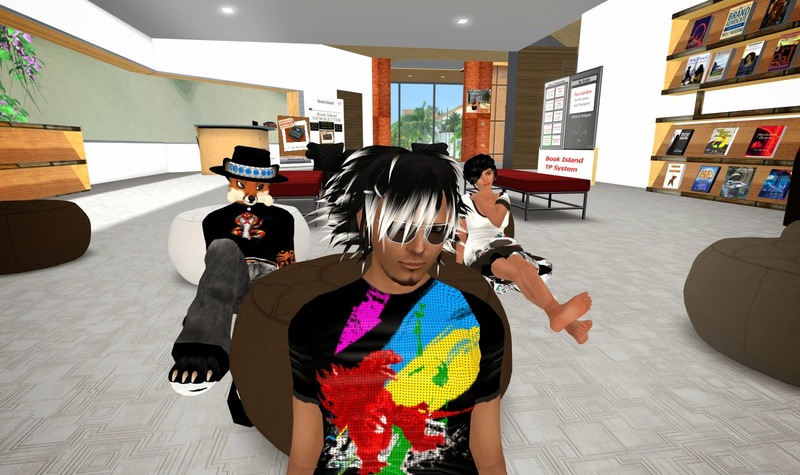 Several avatars took advantage of Open Mic wanting to read his or her story. Klannex Northmead went first reading his own writing with a voice Selina seemed to like. His poem was about the spring. I was next as I took a sample from one of my stories that I wrote for one Rio The Otter. I announced in main chat that I was bought by him at a tail sale. Selina asked what a tail sale was intrigued never hearing the term before. I told Selina, "Yup I was auctioned off so he bid the highest for me. Here's part of what I wrote for Rio." Rio walked to the end of line which in his good fortune wasn’t very long. Despite the short line a red dragon tried to fly to the front. A pink griffin male fearlessly put his hand up to block the line cutter. He wore a black Club Zero shirt with baggy black jeans but they were well buckled to his waist. “Just because you can breathe fire doesn’t mean you’re getting in quicker than anyone else,” the pink griffin spoke with authority, and his eyes could cut through stone the way he glared at the seven foot dragon. The griffin was tall and he had a large frame, but the dragon towered over him. The Dragon tried to fly above the griffin but he merely flew up with him and blocked him again. Everyone in the line gasped. I stopped reading after a while keeping in mind that Selina gives everyone a time limit making sure everyone gets their fair share of reading time. Leslye read poetry about clementines about their taste. Selina herself read a sample of her story about a collar around someone's neck. Bhelanna Blaze AKA Bhelanna Resident read a poem named stew which her mother loved. It talked about her stew reciepe was passed down from generation to generation with various herbs and spices put into the stew. She was very sad that her mother passed away due to cancer back in May. She braved on despite her real life loss and read another poem later related to porches and homes. Klannex Northmead read another poem about god and ego. Another reader James MacCloude read part of a story that sounded something Stephen King would write. Everyone's cellphones were dying as if something really scary was going to happen in his story. At the end of the event there was a drawing for 300L just for showing up. Sisterbutta resident won the 300L as Selina announced a summer soltice event for the following weekend. Looking over the notecard I saw events like boat rides and tarot readings for both days Saturday and Sunday. Like the SL Newser celebrating four years Book island is holding on strong always having events to draw in readers and writers to particpate and have fun. If you have a story or poem that you would like to share stop on by at 1pm SLT every sunday for Open Mic.Even if you don't wish to read your own literary work you can ask someone else to read for you. On top of that you could make new friends sharing in your writing and reading interests. And everyone could always use new friends.